It’s like being the kid at the candy store window who has no money to buy sweets. For years, McGill students and researchers working at McGill University Health Centre (MUHC) facilities had been unable to gain access to McGill servers because the Ministry of Health regulations concerning the interconnection of networks are extremely restrictive and complex. Last fall, when the MUHC IT team approached McGill NCS to collaborate on a project that would rectify the situation, Mitsialis jumped at the opportunity. 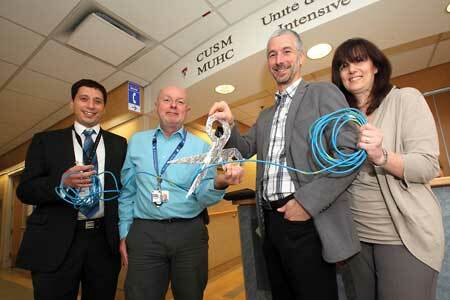 But having additional users doesn’t mean slower network services for MUHC employees. McGill traffic flows on a special channel that already exits between the University and the MUHC, which means the latter’s bandwidth isn’t overtaxed. While not all MUHC facilities have WiFi, the network is expanding – which, by extension, means McGill’s network is growing as well. As existing buildings are refurbished or renovated and new buildings are built, they get equipped with WiFi capability – provided they aren’t slated to close upon the completion of the Glen Campus, which is expected in 2014. That being said, some of the older MUHC complexes have been fitted with WiFi because of special circumstances. The Royal Victoria Hospital, for example, has WifI capability in its emergency area because it is equipped with carts that use wireless technology to gather patients’ vital signs. “If I’m waiting in the emergency room there I can actually get some work done,” said Mitsialis. With industry numbers showing that the average individual has 2-3 electronic devices, this kind of network access for McGill students and researchers is invaluable.